Padmasri awardee Prathibha Prahlad is a highly respected performer, choreographer, author, scholar, arts administrator & Guru. 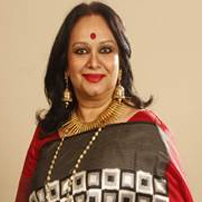 With indefatigable energy and passion, Prathibha Prahlad has pioneered India’s most prestigious arts festival – Delhi International Arts Festival. Her innovating efforts in creating India’s Signature Arts Festival, DIAF, has given a new dimension to India’s cultural footprints globally. A renowned culture specialist, she is a frequent invitee to international conferences.